Portugal, like most southern European countries, is no stranger to the almighty espresso. 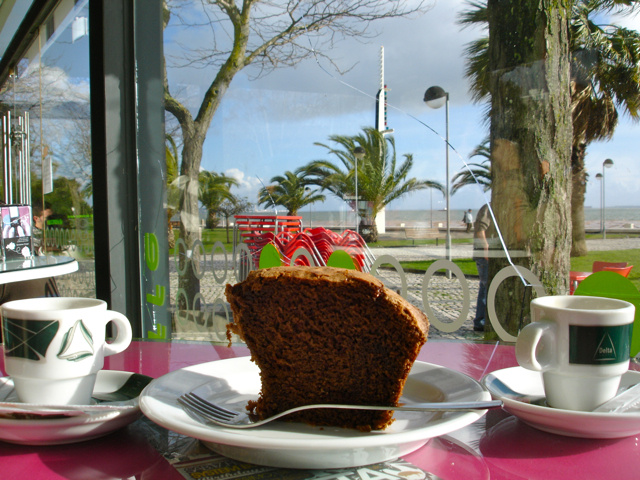 In fact, café is so ingrained into the Portuguese lifestyle, culture and history that without this dark and robust beverage, the country would most certainly come to a complete halt – or at least a short metaphysical pause. In part, this passion for goes well beyond a small caffeine jolt, as the flavor and quality of Portuguese coffee have been touted as legendary. How does such a fine cup o’ joe find its way to Portugal? After the age of conquest, circa the 15th century, most of Portugal’s colonies turned out to be some of the great coffee bean producing regions of the world to which their trade connections still thrive today. The Portuguese are partially responsible for the universal success of coffee, when Francisco de Mello Palheta was sent from Brazil to French Guiana to fetch a coffee plant in 1727. In the following years, the Portuguese colonists initiated the first coffee plantings in Brazil. Throughout the rest of the 18th century, Brazilian coffee beans were hauled back to Portugal for roasting (torrefação) and enjoyed by the royal court and noble houses. After the great 1755 earthquake, the Marques de Pombal incented the inauguration of the first public cafes in Lisbon, which were held in high regard as centers for debate and educated thought. These esteemed cafes became the meeting point for both famous Portuguese artists and politicians alike. For the next century, coffee became the main export of Brazil, founding many of the legendary Portuguese companies that still exist today. Currently, there are approximately 12 leading coffee companies, and several small regional companies dotted throughout the country. As mentioned before, you can’t meander down a stone street without passing at least a handful of cafes. With the exception of that first, morning espresso, if you ask most Portuguese why they drink coffee, they espouse its intense flavor. Consequently, it’s enjoyed throughout the day including: as a mid-morning as a break, one after work as a way to meet up and socialize with friends, and one after each meal. Thus, on average, one might enjoy around 3 bicas a day. The term bica,  is used by the Portuguese to mean a regular (short) espresso and “bica cheia” if you want a long one. Bica is not actually a real word in Portuguese and there are many theories as to how the term was coined originally. Mind you, the term “bica” is used in Lisbon only. In Porto, it’s called “cimbalino“. The term came from the first espresso machines in Portugal, which were branded, “La Cimbali”. Therefore, cimbalino means “little cimbali”. According to the famous Café A Brasileira in Chiado (or Majestic Cafe in Porto), there are two versions. The first version references a man who received a poor cup of coffee when visiting the cafe one day. He then asked for a bica, meaning that he wanted the coffee to be made from freshly roasted beans, as opposed to bulk, mass produced coffee. The second version is that on one, very cold day in the early 1900’s, a man by the name of Luis Gama came from Ribatejo with a large group of men for coffee. At the time, the single espresso style coffee didn’t exist and until 1920, filtered coffee was brewed in bulk and kept in large, wooden cafeteiras in which the waiters had to fill each cup one at a time. But before they would bring the cups of coffee to the table, the waiter would first set down the silverware, the sugar container, and the milk container and then would finally bring the coffee, which by the time the last cup arrived, was practically cold! Albino Goncalves was the known waiter at the time and everyone called him Albino. So when Luis Gama yelled for him to bring him a fresh, hot coffee, he yelled “O Albino, vai mas é á bica!” Which meant “Albino, go to the bica!” and was apparently heard by everyone in the café. Afterward, people would use Gama’s saying jokingly “O Albino, para o senhor Gama, é bica!” or “Albino, for Mr. Gama, it’s bica!”, and thus supposedly, bica was designated for the future espresso. Some still say that bica is just an abbreviation for “Bebe isto com açucar”, which is Portuguese for “Drink this with sugar”. And from my observation of coffee drinking habits here, this theory sounds more plausible. If you didn’t get the hint already from my past articles on Portugal’s pastelerias and regional pastries, the Portuguese adore sugar, as further exemplified by the sugar packet that come with chocolate milkshakes. Hence, when you order a bica , it always comes with a packet of sugar, which is by the same brand as the coffee sold, as are the cups and saucers and logo on the front awning of the cafe. However, the Portuguese don’t seem to have a preference for any particular brand of coffee, claiming they all taste “fine. Yet despite my Portuguese brethren’s lack of preference for their coffee brands, I was curious. So, I recently took the time to taste-test five of the most popular Portuguese coffee brands, giving each one a score of 1-10: 1 being the best and 1 the worst. Each was tasted as a short espresso with no sugar added; however I did make a note if the brand came with a memorable sugar packet. I also provided a little background information I gathered on each brand, including where they get their beans. I have also listed some of the other known coffee brands that I didn’t get a chance to taste test, but that you might want to explore during your stay in Portugal. However, please keep in mind that a poor coffee can also be a result of the machine, the person making the coffee or the quality of the water. Therefore, please read my notes with these additional factors in mind. I hope you’ll have the chance to experience and enjoy this wonderfully warm coffee culture when you visit Portugal, as I look forward to having every day here. Stop in a gourmet store, or even a supermarket, before you leave and get some of Portugal’s delicious coffee to take home with you! 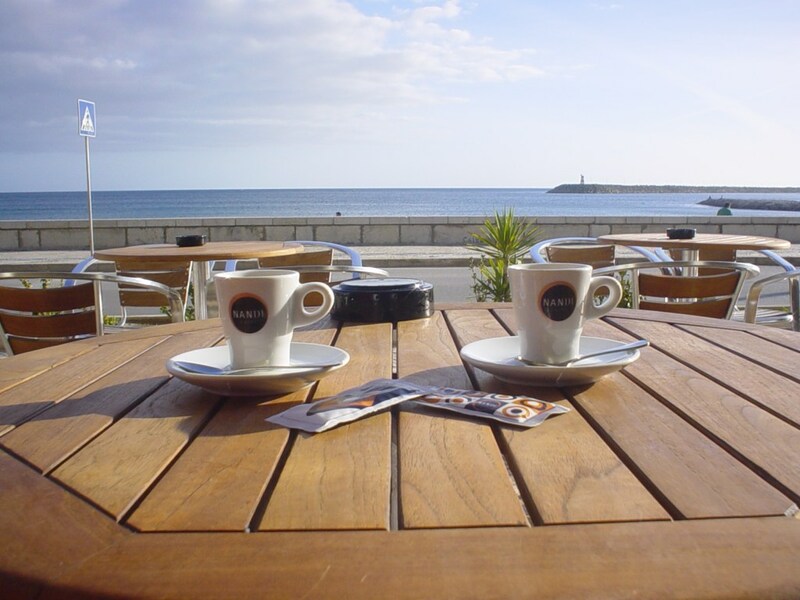 What is your favorite Portuguese coffee brand and how do you like to experience it? Delta Ouro (Gold)- selected from a lot of Arabica beans from the Americas and characteristic single vintage African Robustas. Intense and full-bodied. Platina (Platinum)-from the best selected Arabicas and Robustas. Delicate aroma and smooth flavor. Diamante (Diamond)- Taken from the best green coffee beans from the best origins and twice roasted in the Delta style. Rich aroma and incomparable flavor. This one is my all-time favorite, as it is of most Portuguese I asked who actually had a preference. Nicola: This brand originated from Lisbon’s emblematic Cafe Nicola, popular with politicians and writers during the early 1800’s. It is now owned by Nestlé Portugal and the coffee beans come from Brazil, São Tomé and Principe. 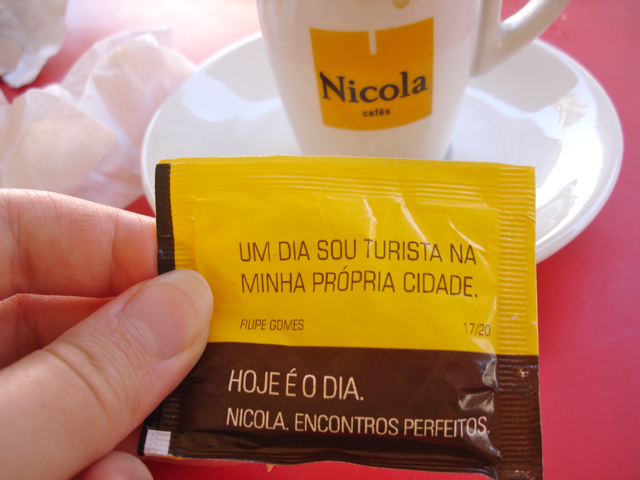 Nicola’s sugar packets have cute, motivational messages on them and “wish you a good coffee”. Café A Brasileira: One of the most famous cafes in Lisbon and a huge tourist destination. The brand has been around since the late 1800’s under different names, and the current name of the roasting and distribution company since 1906. The coffee beans come from (no surprise) Brazil. Sical: Been around since 1947, started as a coffee importer from Porto of pure roasts. They were acquired by Nestlé Portugal in 1987. Sical is the only brand that has cafes located down in all the Lisbon Metro stations as grab and go baristas without any seats. Coffee beans come from Angola. Look for these other well known Portuguese coffee brands as well: Buondi, Bicafé, Chave d’Ouro and Camelo.